For the Chiltern Medical Clinic’s opening hours please click here. Our receptionists can be reached on either 01491 873 989 or 0118 958 2016 and will be happy to assist you in making an appointment. You can also contact us online to request an appointment here. All consultations will include a full medical history and patients are advised to bring any medication with them so we can assess suitability of treatment. Consultations are conducted in private in a treatment room with a qualified member of staff. The Clinic will issue a consent form for the patient to read, understand and sign prior to proceeding with any treatment. We will also seek the patient’s consent for taking photographs of the area of treatment for comparison purposes. A contract for treatment will be established between the patient and the Clinic upon signing the appropriate consent form. Terms and conditions will be fully explained and agreed prior to any treatment taking place. Depending on the outcome of the consent and first consultation, the Clinic may take a view to not proceed with any treatment and may recommend another form of treatment for the patient or refer them elsewhere. For an estimate on how much a treatment may cost, we recommend that you contact the Clinic for our latest prices and special offers. For specific information based on your individual needs, we will be happy to arrange a no-obligation consultation. Our Online Pricelist also provides a general guide to treatment pricing. Please note that there is a charge for some consultations. This will be advised upon booking. This Clinic has a policy of patient confidentiality and all information and records are kept safe and confidential. The privacy and dignity of patients is respected at all times. Any discussion between patients and staff regarding their treatment / potential treatment take place behind closed doors. All consultations with patients are carried out in person by qualified personnel in the privacy of the consultation/treatment room. Records of all consultation and treatments are kept securely in the patient’s notes. A record of the chaperone’s presence will kept in the patient’s notes. The member of staff in charge of the case will make the final decision regarding presence of the chaperone. We treat children or young persons in accordance with our Consent Policy. Patients under the age of 18 must be accompanied by a parent or guardian, who will also sign any consent forms on the child’s behalf. A medical referral (a letter from the patient’s general practitioner) is required for persons under the age of 12 for laser hair reduction / removal. A medical referral (a letter from the patient’s general practitioner) is required for persons under the age of 16 for laser treatment, minor surgery and treatment of acne. We do not permit children to be brought to the Clinic who are not undergoing treatment and cannot accept responsibility for any children while adults are receiving treatment. All such incidents should necessitate a rescheduling of the patient’s appointment. It is not acceptable for members of staff to child mind while parents are receiving treatment. Patients have the right access to their records at the Clinic in accordance with the Data Protection Act 2018 and the Freedom of Information Act. If you require access to your records, please contact the Clinic Manager, who will discuss the issue with you and agree on the level of information to which you require access. This Clinic will ensure that information provided to patients and prospective patients and their families is accurate and that any claims made in respect of services are justified. The clinic ensures that all its adverts, patient leaflets and services it offers, complies with the Advertising Standards Authority (ASA). In case of any complaints, all the advertising information will also be released to the ASA by this clinic for verification or investigation, as appropriate. The Clinic obtains the views of its patients by means of s patient satisfaction survey, which is distributed to random patients at least once a year. We use these to inform and improve the provision of treatment and care of prospective patients. Results are available to patients to view and to the CQC upon request and/or inspection visits. Cancellations should be made by phone, email or in person at least 24 hours prior to your scheduled appointment to avoid a charge being levied. We would be grateful if you could cancel your appointment as soon as you know you won’t be able to attend to avoid any confusion and to help us maintain our level of service. We do our best to accommodate late arrivals. However, there may be times when a late arrival will result in reduced consultation time, or we may have to reschedule your appointment. Make it possible for the complainant to discuss the problem with those concerned, if appropriate, or the Clinic Manager. Identity what we can do to make sure the problem doesn’t happen again. In the event of any complaint, patients are asked to speak or write to the Clinic Manager in the hope that an early resolution may be possible. Verbal complaints can be also made to staff, who will then refer the complaint to the Clinic Manager. We will endeavour to provide a formal response within 1 working day. If we are unable to, the complainant will be notified of the outcome in writing within 20 working days of the complaint being received.
. We will acknowledge the complaint within 2 working days of receipt and provide a full written response within 20 days. In the case of any complaint, our aim is to provide a satisfactory resolution for the patient .If your complaint is not resolved to your satisfaction, however, you can make a complaint to the Local Government Ombudsman and/or the Care Quality Commission. The Chiltern Medical Clinic is an independent healthcare provider and is therefore registered with the appropriate regulatory body. We work hard to demonstrate our compliance to exacting standards and set outcomes. The Chiltern Medical Clinic is an advocate for the clinical governance criteria set out by the Care Quality Commission (CQC), under the responsibility of the Nominated Individual (NI), and this is reflected not only in the service that we provide to our patients but also in our exemplary regulatory record. In line with the regulatory compliance, The Chiltern Medical Clinic ensures that all of its doctors are registered with the General Medical Council (GMC) and are specialists in their field, with certification which reflects this and hold a valid licence to practice with the GMC. The Chiltern Medical Clinic always ensures that any doctor has extensive experience in their field of speciality, be it cosmetic surgery, liposuction, varicose vein removal, or the administration of anaesthetics (i.e. Anaesthetist). 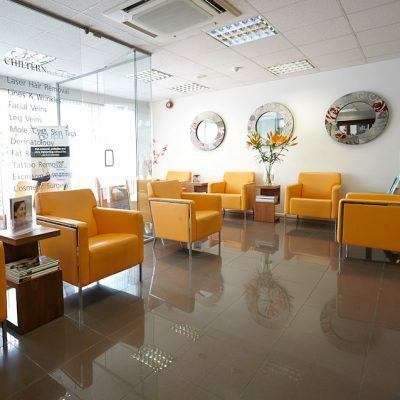 The Chiltern Medical Clinic employs aesthetic therapists who are fully trained on a continuous basis in cosmetic pre and post-operative care and non-surgical treatments. It is through this continuous training that we strive to meet both the expectation of our patients and those of the regulatory bodies. The Care Quality Commission (CQC) for England (provider ID 1-3558261389).